As stated in the societal laws of comic books, bad guys will always lose. Eventually. Sometimes it takes a while, but choosing evil will no doubt end with the collapse of everything you maliciously worked so hard for. And thus the same rule must be applied to Lex Luthor. Today, he loses everything. Because he’s mean, and that’s what happens when you’re not nice. Y’see, I’m not a scientist, but clone bodies tend not to hold up as well as normal, birthed bodies. Because of science. Something about artificial creations (and plot) makes these atrocities age badly. Accelerating growth or whatever. Look, the reason for Lex Luthor’s clone body starting to fail isn’t important – the comic book world just demands that you accept it is. They’re talking about Bizarro, if you’re curious. 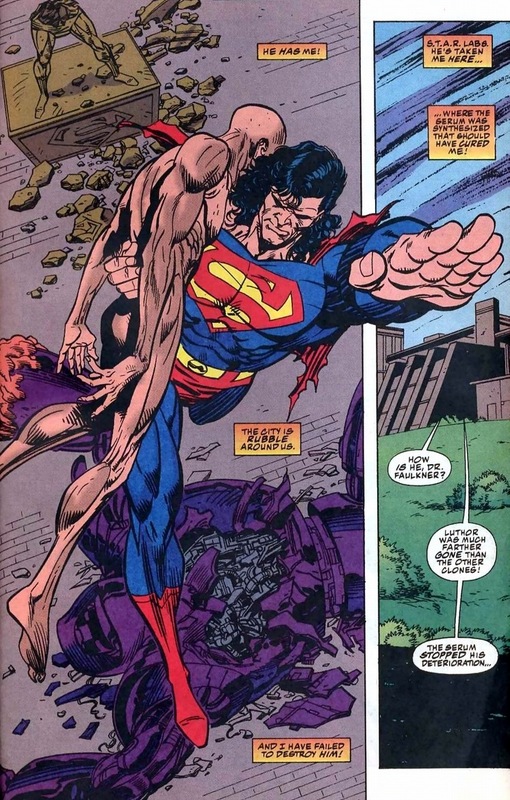 So after Superman came back from the dead (four months after he died), all of Lex’s brag-able triumphs began to fall apart. He loses Supergirl, his friends, and that beautiful youthful hair he treasured so much. 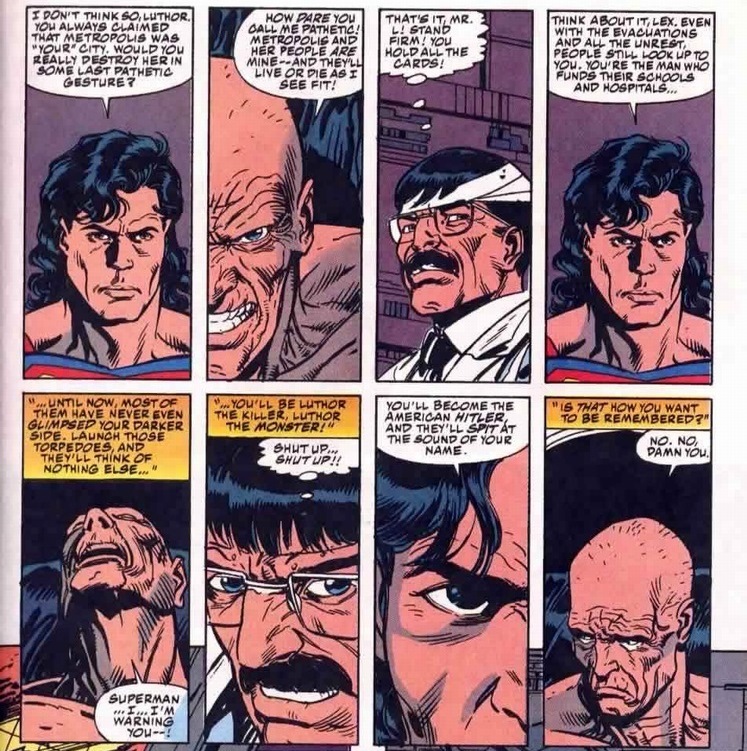 Lex Luthor can’t escape fate: destiny proclaims that Lex Luthor cannot have hair and hair he will not have. Let him try to fight and crawl against the current of the grueling status quo, but baldness wrapped its legs around Lex a long time ago to prevent him from ever pulling out. And this kind, defeated Lex you see above? When the beard goes, so does his generosity. 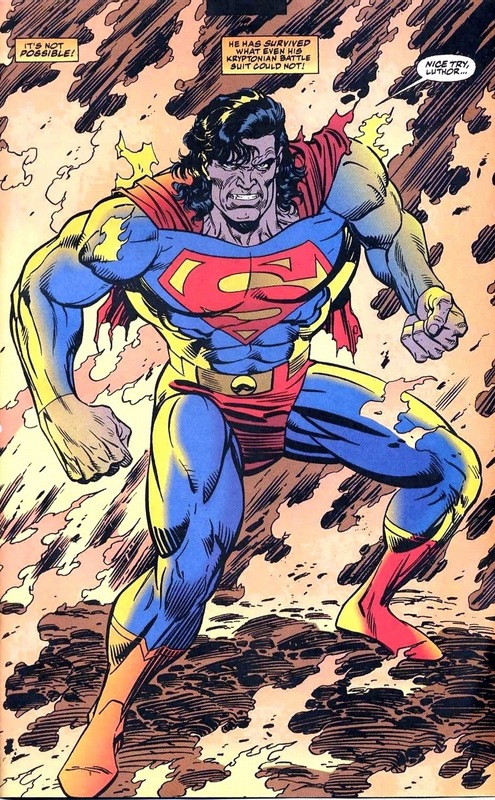 We should talk about Mullet Superman. It’s an embarrassing phase of his life he wishes to forget. We all make these horrific mistakes. I wore Hawaiian shirts in high school, and a single, stoic tear rolls down my cheek each time I think back to that time. 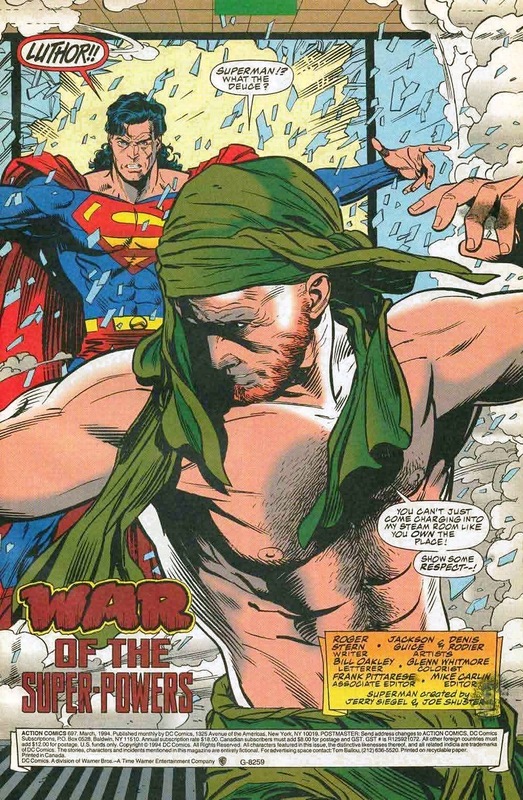 Unfortunately, since Superman’s fashion terrors live forever in the pages of ’90s comics, we’re reminded of this awful era with every page we turn. Luckily, everyone in ’90s comics made tremendous fashion errors (mostly leather), so Superman’s class photo sits between good company. 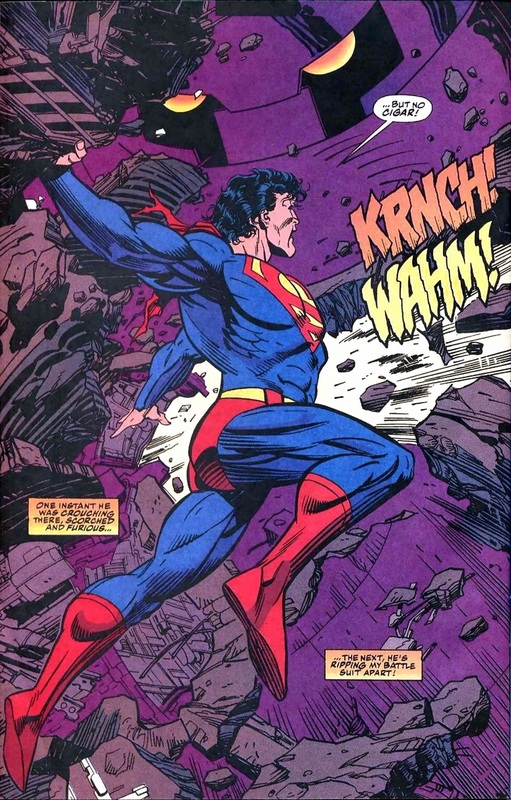 Still, Superman – the most perfect superhero ever – proudly wore a mullet. 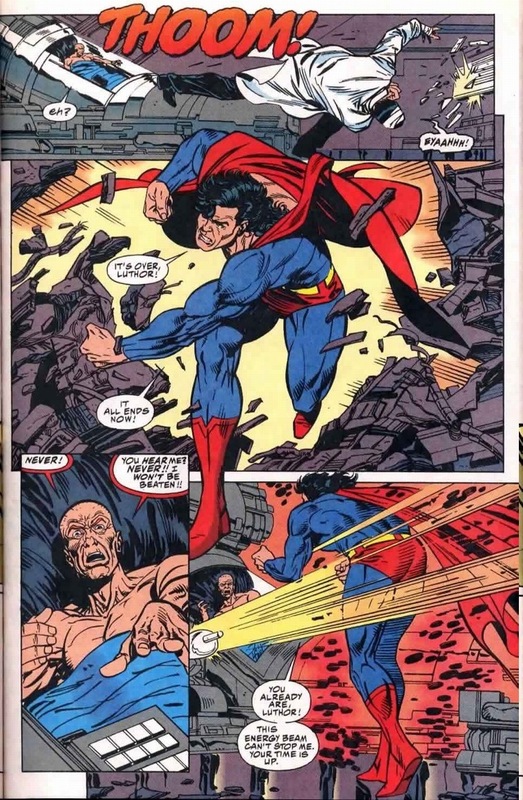 Despite Superman’s obvious argument, the assistant still launches the missiles and destroys Metropolis, Lex’s legacy, and everything else associated with Lexcorp. 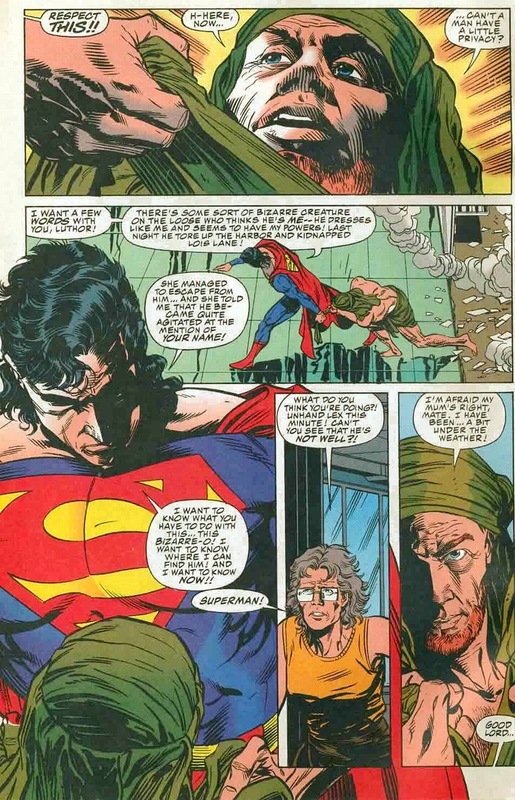 But remember when Superman could stop Lex Luthor from destroying entire cities by reminding him that killing millions of people would hurt his reputation? I’m fascinated with this scene, as it brilliantly showcases Lex’s incredible complexity – he wears a secret identity of the philanthropic businessman while his real hidden supervillain identity seeks to maim and destroy the same ideals he holds up in public. Similar to Superman, Batman, and the entire roster of DC superheroes, Lex also wears a mask. We get it, the Joker doesn’t care about insignificant stuff like likability, but Lex operating on two fronts makes his motivations and actions far tougher to predict when the big schemes get actualized. 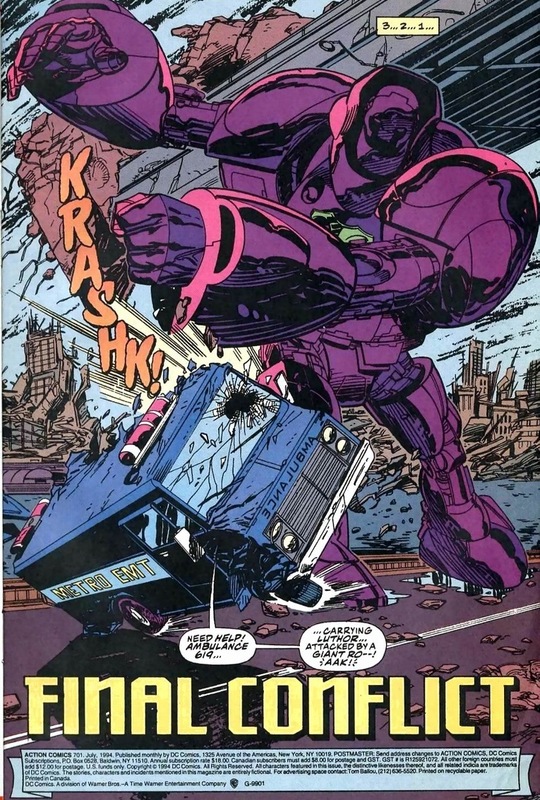 Like say, maybe he won’t level Metropolis to become the American Hitler, but what about a giant purple robot wrecking the city in a weird Gundam Stephen Hawking combo? Also, you can always click a picture to see a larger version of it. 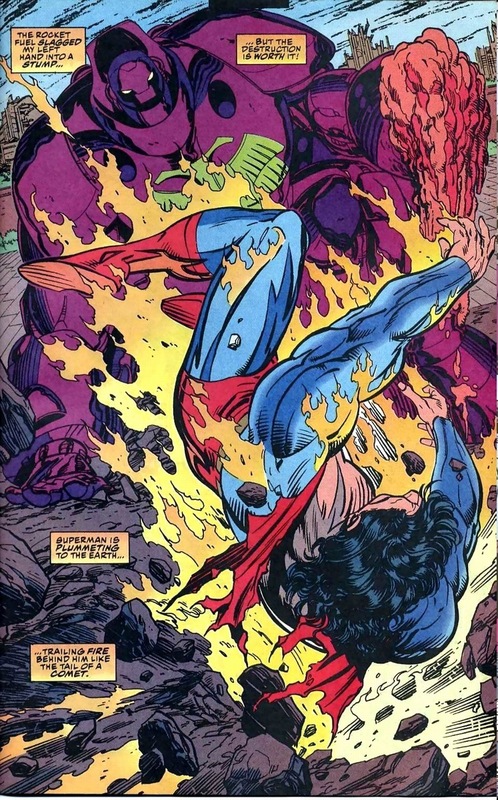 As Lex’s final act in his failed-clone body, he uses a mech to light Superman on fire. 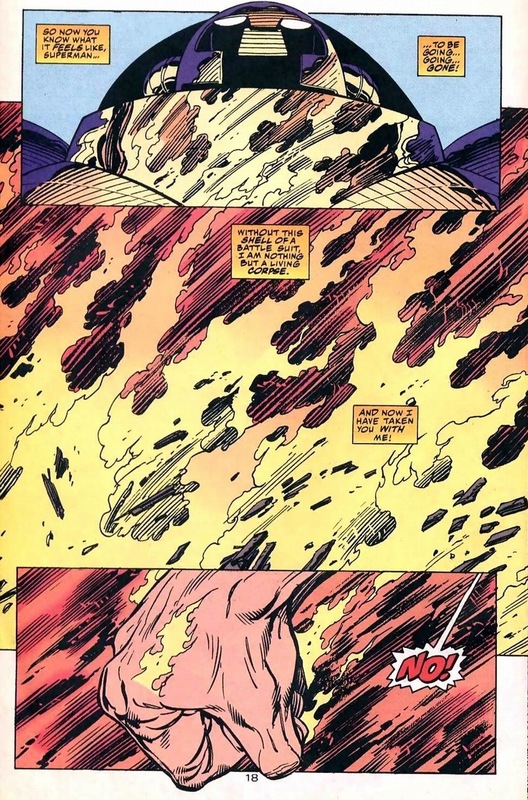 A fantastic way to go out, despite Superman pretty much being immune to fire. Do you see the destroyed city behind them? 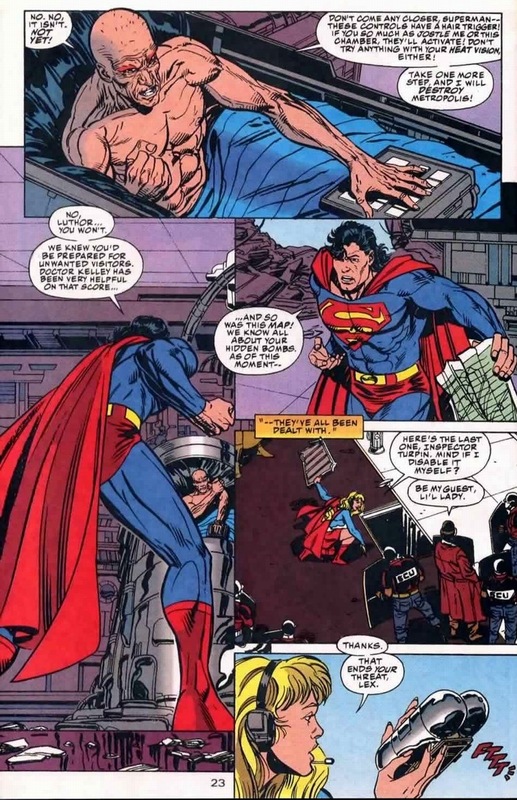 Lex blames Superman for forcing his hand. If only the Man of Steel hadn’t interfered in Lex Luthor’s evil plans, then the missiles would still be happily in their silos. Because Lex is a sociopath, of course. The terminal cancer, the love of Supergirl, the decaying body – everything he did to undo that was because of his own hand. Literally, because the kryptonite ring on his finger began the slope into tatters in the first place. 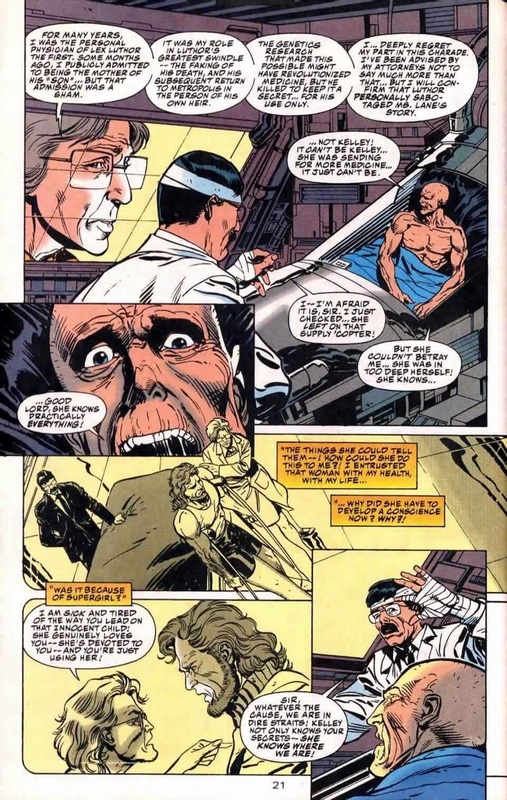 Don’t feel bad for dear Lex, because if comics books have at least one silver linings in their convoluted universes, bad things will happen to bad people. His hair may be permanently gone, but his body still recovers. See how on Friday! I think it has more too do with Lex Luthur is iconically bald so the actors who play him will be bald maybe that will change it did change for Batman with Adam West in which Mister Freeze had hair and did not have hair I just wish they made up there mind like Catwoman too and Riddler I didnt know it but John Astin had played him first then Frank. 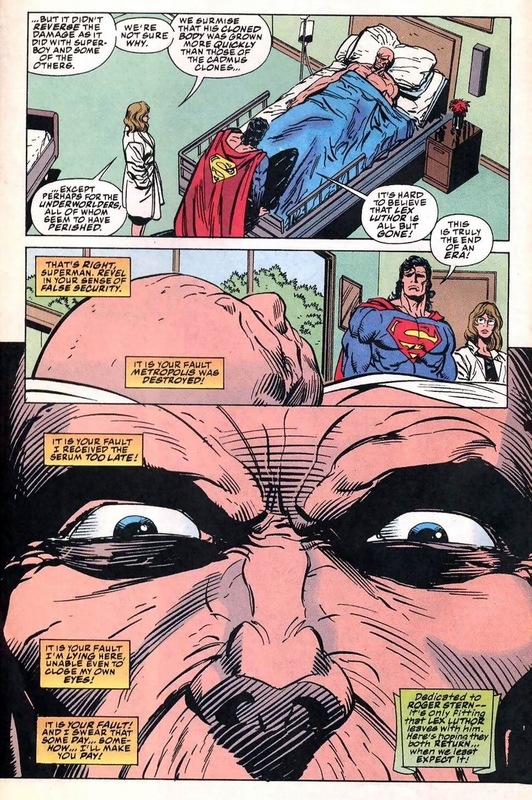 Lex’s baldness was actually an artist’s error. The Golden Age Luthor was originally a red-head. 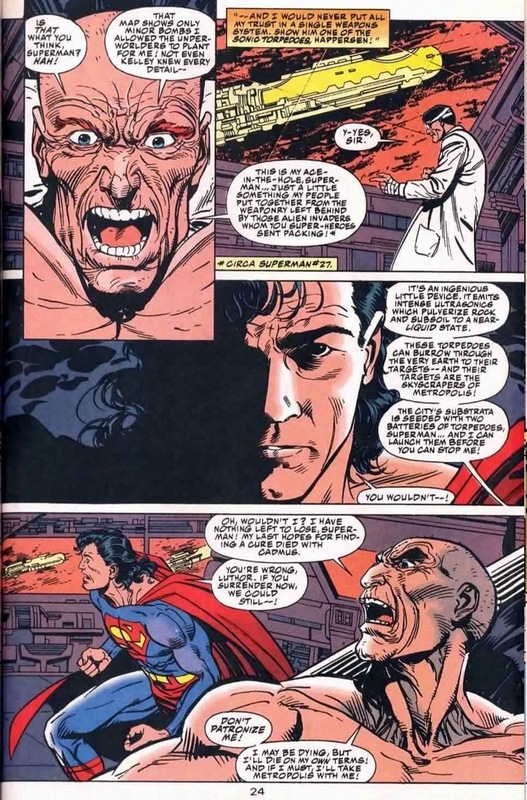 One of Supes’ other enemies was a bald mad genius called the Ultra-Humanite. 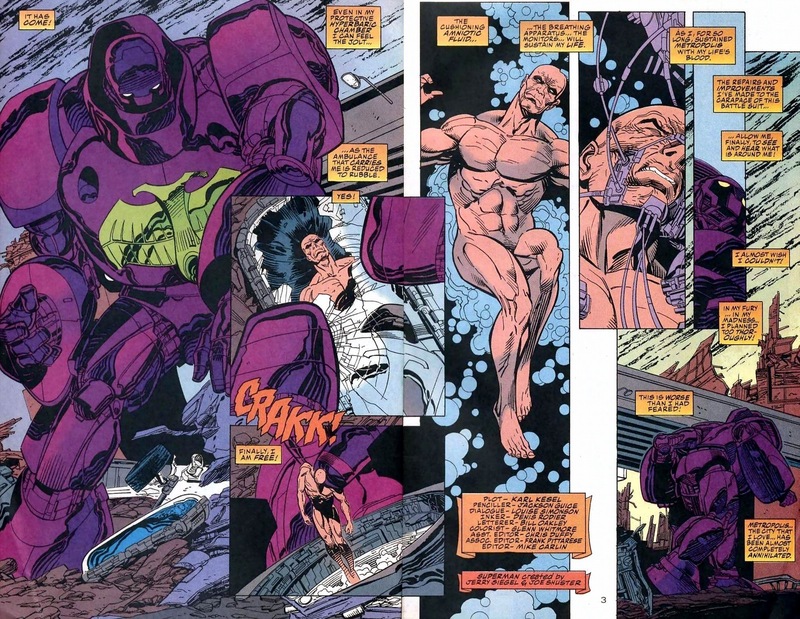 So when UH showed up again, he was mistaken referred to in the comic as Lex Luthor due to one of the artists confusing the two. TO cut down on confusion, the fully coiffed Lex was later called “Alexi Luthor” and came from Earth-2, like the pre-Crisis JSA did. Then Crisis happened, and Brainiac turned “Alexi” to ash without a second thought. THE END. well I hate when they do that!